The stars at ASU Gammage aren’t just on the stage. The Ahearns have been supporters of ASU Gammage since their first dates at the venue in their twenties. They continue that support through their work connecting disadvantaged youth to the arts, spearheading the historic theater’s restoration and spending countless hours volunteering at ASU Gammage events such as the 2004 presidential debate and Homecoming Block Party. “I think volunteering keeps you alive, and it keeps you young, and we’ll keep doing it as long as we can,” Susan Ahearn said. The Ahearns have been volunteers at ASU Gammage since the 1970s and have watched the arts change the Valley. Their philanthropic donations began in 1989 and they are two of ASU Gammage’s most influential donors. The Jerry Award honors individuals who embody the standard set by the late Jerry Appell, a fervent supporter of ASU Gammage. “I hope we will inspire others to get invested themselves, not just buy a ticket and go to a show; but that idea of saying this theater and what is going on is important to them, and they want to support that in the future,” Bill Ahearn said. The Ahearns are committed to paying forward the opportunities they have had in their lives. They hope to raise up young performers and continue assisting ASU Gammage in bringing world-class performances to the people in Arizona. Bill and Susan Ahearn celebrate "Hamilton" arriving at ASU Gammage. The Gammy Award winner supports that same value. 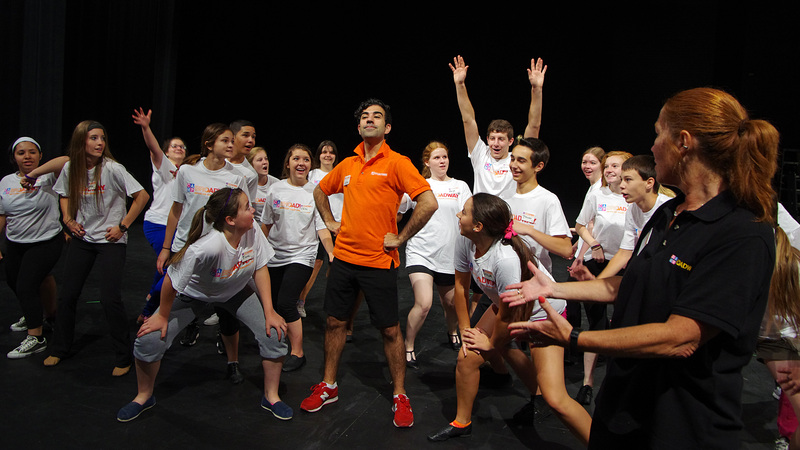 Camp Broadway is an immersive week-long experience where high school students put on a full-length musical with assistance and mentoring from professionals in the musical theater industry. Accepting the award on behalf of Camp Broadway is Susan E. Lee, who founded Camp Broadway in 1995 in a small studio space in New York City. She is currently the CEO of the organization. Susan Lee, CEO and Founder of Camp Broadway, will accept the award on the organization's behalf. “Susan is the fearless leader of an organization that actively creates the next generation of artists, theater-goers and leaders,” Jennings-Roggensack said. Winners will receive their awards on March 12 at ASU Gammage. Water is water, but what kind of molecular arrangement does it have? Water — always important, always controversial, always fascinating — remains surprising. For a substance that covers three-quarters of the Earth, researchers can still be surprised by some of its properties, according to Arizona State University chemist C. Austen Angell. Angell, a Regents' Professor in ASU’s School of Molecular Sciences, has spent a good portion of his distinguished career tracking down some of water’s more curious physical properties. In a new piece of research published in Science on March 8, Angell and colleagues from the University of Amsterdam have, for the first time, observed one of the more intriguing properties predicted by water theoreticians — that, on sufficient super-cooling and under specific conditions, it will suddenly change from one liquid to a different one. The new liquid is still water but now has a lower density with a different arrangement of the hydrogen bonded molecules, with stronger bonding making it a more viscous liquid. “It has nothing to do with ‘polywater,’” Angell said, recalling a scientific fiasco of many decades ago. The new phenomenon is a liquid-liquid phase transition, and until now it had only been seen in computer simulations of water models. The problem with observing this phenomenon directly in real water is that shortly before the theory says it should happen, the real water suddenly crystallizes to ice. This “crystallization curtain” has held up progress in understanding water physics and water in biology for decades. “The domain between this crystallization temperature and the much lower temperature at which glassy water (formed by deposition of water molecules from the vapor) crystallizes during heating has been known as a ‘no-man’s land,’” Angell said. “We found a way to pull aside the crystallization curtain just enough to see what happens behind — or more correctly, below — it." Phase transitions of water are important to understand for a multitude of applications. For example, the well-known and destructive heaving of concrete roads and footpaths in winter is due to the phase transition from water to ice under the concrete. The phase transition between liquid states, described in the current work, has much in common with the transition to ice but it occurs at a much lower temperature, about -90 C (-130 F), and only under super-cooled conditions, so it is likely to remain mostly a scientific curiosity for the foreseeable future. Angell explained that a couple of years ago he and his research associate Zuofeng Zhao were studying the thermal behavior of a special type of “ideal” aqueous solution they had been using to explore the folding and unfolding of globular proteins. They wanted to observe these solutions’ ability to supercool and then vitrify. Seeking the limit to the glassy domain, they added extra water to enhance the probability of ice crystallization and found that instead of finally evolving heat as ice crystallized (leaving a residual unfrozen solution) as is normally found when cooling saline solutions, it actually gave off heat to form a new liquid phase. In the Science paper, the team with Woutersen, his student Michiel Hilbers and his computational colleague Bernd Ensing has now shown that the structures involved in the liquid-liquid transition have the same spectroscopic signatures — and the same hydrogen bonding patterns — as are seen in the two known glassy forms of ice produced by laborious alternative processes (high- and low-density amorphous solid phases of water). The results would seem to “provide direct evidence for the existence of a liquid-liquid transition behind the crystallization curtain in pure water,” Woutersen said, adding that the findings offer a general explanation for the thermodynamic anomalies of liquid water, and a validation for the “second critical point theory” put forward by Gene Stanley’s group to explain those anomalies.